“My shoulders are aching from the weight of the backpack, the sun is burning, the wind is blowing me backwards, I am running out of water already and I still have 125 km to go.” This was the entry in my travel diary penned down after walking for only 2 or 3 hours. No, this was no joy, this was no holiday, it was a struggle. A struggle against pain, fatigue and the temptation to give up. 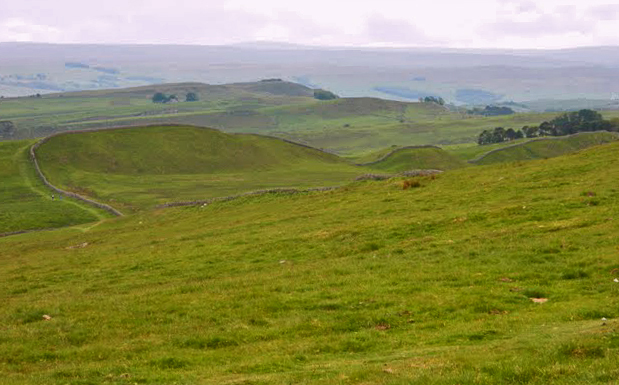 I had set out to walk across England along the Hadrian’s Wall, a Roman fortification in Northern England. 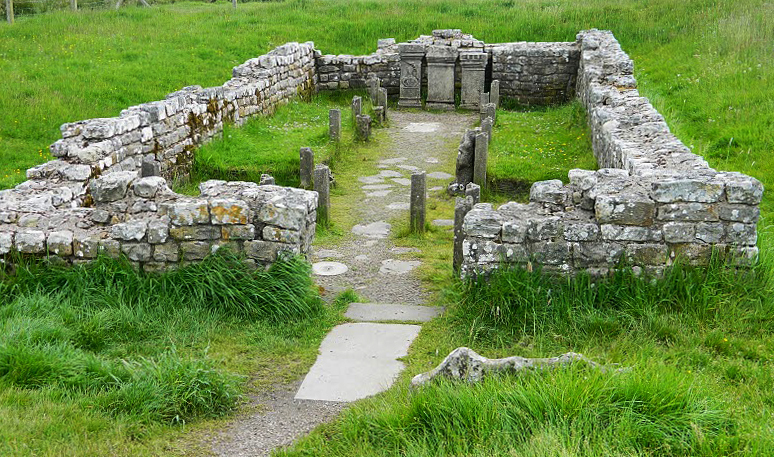 It was built after 122 AD to mark the northernmost border of the Roman Empire and to defend it against possible rebellions from the far North of England and from Scotland. The route of Hadrian’s Wall stretches from Wallsend in Newcastle to Bowness-on-Solway in the West. 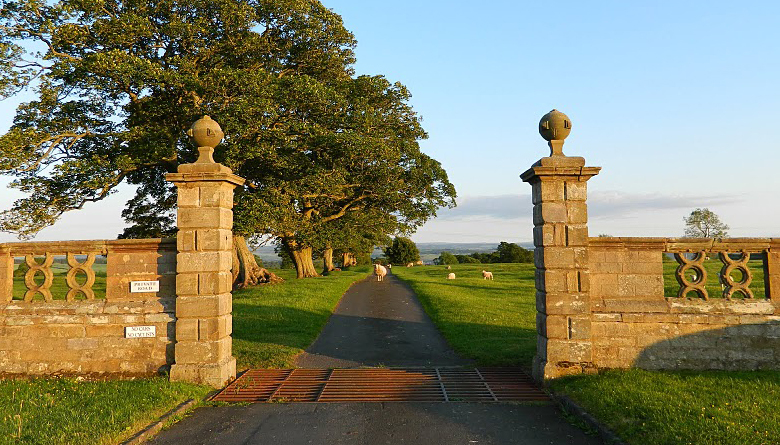 I left Newcastle on the beautiful sunny morning of 6 June 2011, walking westwards and following the well-signposted Hadrian’s Wall Path which meanders along the original route of the Wall for around 84 miles = 135 km. Newcastle looked like an interesting city, but I rushed out of it because I couldn’t wait to get to the nature and away from the bustle of traffic, commerce and people. After leaving Newcastle, the route becomes quite beautiful, through forests and parks, along golf courses and across meadows. But no sign of Hadrian’s Wall yet until Heddon-on-the-Wall, a cute little village that I reached via an unforgiving steep and long ascent. But once that climb was mastered, I was finally rewarded with the first piece of Hadrian’s Wall. The day continued to be sunny and hot, the walk continued to be strenuous. The intervals between my rests became shorter. Each time I fell down in the grass, I was so exhausted that I could have fallen asleep better than in the most comfortable bed. But I had to carry on. Not that I had a specific waypoint in mind; I had simply given myself a bit more than 5 days to complete the whole journey across the country. But especially on the first day, I wanted to walk as far as a I possibly could. One interesting phenomenon was how long it was light in the evening (and how early it would become light the next morning). This far up in the North, it was light until around 2245. Even long after the sun had set behind the horizon, there was still enough light for a long time to search for an appropriate campsite. I had vowed not to sleep in any man-made housing and not even to use official campsites, but wanted to camp wild. I settled down for the night under a row of trees between two fields close to Portgate. Not having bothered to carry a tent, I had to attach a tarpaulin to a tree to protect me a bit from the fierce wind. It was still cold, despite sleeping bag, bivouac sack and almost the whole range of clothes that I had with me. I hadn’t had a pleasant or comfortable night, but being woken by the sun put me in an upbeat and positive mood nonetheless. I packed up quickly and got walking again. Living in London, I always thought England was rather flat. But up north, it’s actually quite hilly, as I became painfully aware, having to conquer one hill after another, all the time the view of more threatening hills on the horizon. In the middle section of this walk, England is extremely empty. Sometimes, I don’t see villages for several hours, something which is very rare for this densely populated island. There are however a few other hikers, most of them not walking alone but as a couple or with friends. People are very friendly and often start a chat or walk together with me for a while. For the second night, I had to sleep under the open sky in a field with sheep, only using a wall between two fields (not the Hadrian’s Wall) as a slight protection against the wind. It was a shorter night even than the first one. 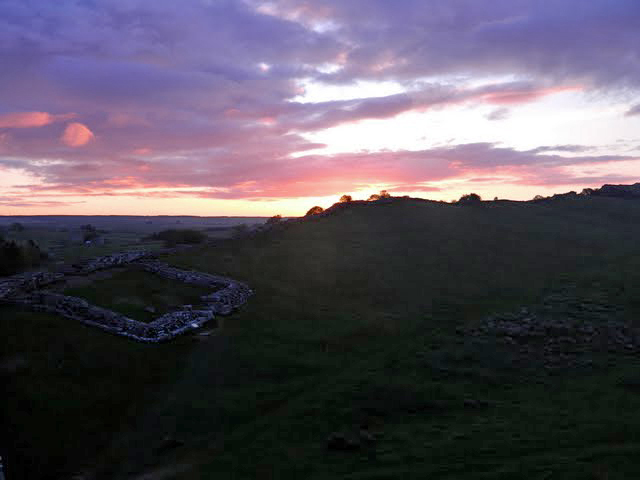 But getting up very early had the advantage that I was already up on Hadrian’s Wall when the sun rose. I didn’t see another living being for another few hours until I came across these cows which blocked my path so vehemently that I had to take a rather long detour. At the end of day 3, my morale was very low. It had been raining, I was cold, I was deprived of sleep, I was dirty, every part of my body ached. When I realised that I could still reach Carlisle on that day (not because I had been fast but because I had started to walk at 0300), I decided to make a reservation for a slightly different kind of camp for this night. I deviated from my original plan and checked into the County Hotel in Carlisle. Because I was quite ahead of my original schedule, I didn’t feel bad about taking a long shower and sleeping in the next morning. On day 4, I was therefore refreshed and could go for the final stretch from Carlisle to Bowness-on-Solway, a trip of about 22 km. This was much less than I had covered on any of the previous days and it was over very flat territory, so it was a rather relaxing end of the tour so that I reached the coast after a few hours and finally smoked a cigar as a reward. Actually, I smoked even two. Overall, it was a really tough trip, stretches of which were a bit monotonous. But there was also some striking scenery and natural beauty. The best thing is the relative solitude, especially in the middle section of the walk. It was an interesting experience to walk for 4 days without any internet, newspaper or radio and with almost no interaction with other people. I realised again how much I prefer nature over civilisation. The moments I enjoyed most were the rests, when I fell down on the grass after walking for 2 or 3 hours, totally exhausted, enjoying the sun and the countless shades of green around me, listening to the sheep’s concert, my head resting on my backpack. Maybe it is only the preceding effort that makes the rest so fulfilling; but maybe lying in the middle of nature is also a beautiful experience without any physical effort. I’ll have to try that once. 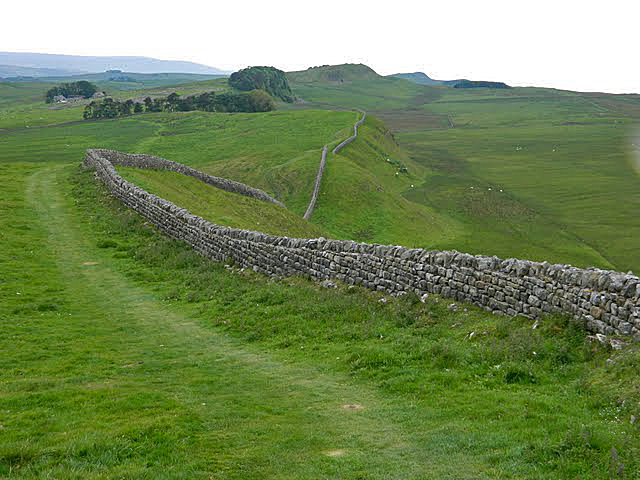 If you have not been dissuaded by this account, please read my advice for walking the Hadrian’s Wall Path. 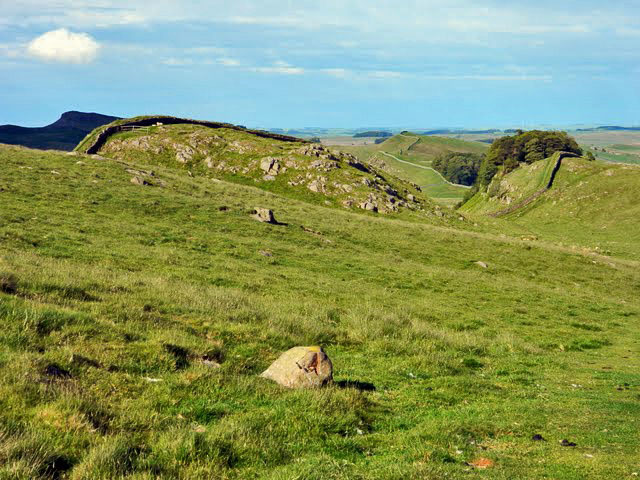 This entry was posted in Photography, Travel, UK and tagged adventure, Hadrian's Wall, Hadrian's Wall path, hiking, Romans, Scotland, walking. Bookmark the permalink. If you’re ever inspired (or crazy enough) to try this again, try this suggestion. First off, no cans of food. They’re easy to carry and cook, but the weight kills you. Second, take bread. From my re-enacting days, it seemed I could always find meat or cheese in some little shop here or there, but bread (especially a good French loaf) was rare. (White, soft bread is common, but doesn’t travel well.) And while I admire your bravery in not taking shelter, do your next one with a simple “pup” tent. We found one, non-military but olive drab, with a rubber floor – dry ground! brilliant Mr Moser. Have you ever been into the Lake District? Die Pilotesse macht einen Rückbesuch und muss schmunzeln, ist sie doch in jungen Jahren mutterseelenalleine von der Westküste Schottlands an die Ostküste gewandert, mit Zelt und Rucksack – und nicht nur dort. the only question that remains unanswered is – why did you decide to do this in the first place? To get out of London. To be alone with my thoughts. I have never seen cows look menacing and yet they do in this picture. I was really annoyed by them. These cows would not move! They forced me to walk a huge detour. Next time, I’ll take a gun with me. You rock! :) And once again, I love the pictures. Thank you! Maybe I’ll walk across Denmark next. Back in 1964, my husband and I tracked the Wall for 2 days with our 4 children (youngest 9 months). Our conclusion: Romans experiencing the cold and fatigue you report, decided they had gone far enough. The purpose of the Wall was to keep the Barbaric Scots out! If you are interested I have a picture of it posted on my WordPress page. I could not figure out how to post the picture to your blog. It was rally interesting to read your page and how you fared on your trip, a group of friends and I are doing this walk in a few weeks in reverse for charity… However we have set ourselves a challenge of doing in in 24 hours, a challenge I have begun to question during training. But a challenge it remains… I hope we can achieve it. Be interesting to hear peoples views. 135 km in 24 hours? Wow, that is quite a challenge! My main problem during the walk was the weight of the backpack. As you won’t need to carry any tents or sleeping bags and not too much supplies, you should do fine with that. The middle section is quite hilly, with lots of ups and downs, but on the other hand you can walk on softer ground there. The last part (from your direction) as you walk/run into Newcastle is on roads, but at least it’s flat. In the middle section, you have no street lights of course, so I would time it that this part is covered during daylight. If you can, pick a day when you have full moon and preferably in June when you have very long hours of daylight up North. I am really curious how it will go. If I still lived in the UK, I would even consider joining you. Great story, very helpful and fun account. How come I never heard of this? Great job on not giving up! I plan to walk the El Camino (probably not in the near future), but I have to say that even by reading your tale my legs and back started to hurt. So it’s that good of an article. Congrats! I did another long distance walk in the UK later, the West Highland Way in Scotland (photos and story coming one day when I have plenty of time). That was longer, but even more beautiful. My main advice: take as little weight as possible with you. On the West Highland Way, I switched to using the luggage carrying service on the third day. From then on, it was a mere joy. Great photos and an inspiring post, thanks. Planning my own walk along the wall but after reading this I want to take a bit longer to soak up the archaeology and nature. Oh and bnb ‘s for hot meals hot showers and pints. That’s a good idea. Also, if you stay at B&Bs, you don’t need to carry any camping equipment and you’ll have a much lighter backpack. It is great to see you blogging from my part of the world! I meet a lot of people in Newcastle doing this walk from all over the world, I need to do it when I am back from Oz. Haha, yes, good point on the wildlife, although I was honestly scared by cows at times. But it’s a really beautiful hike. True, I am often wary of cows! I am glad you enjoyed the experience.